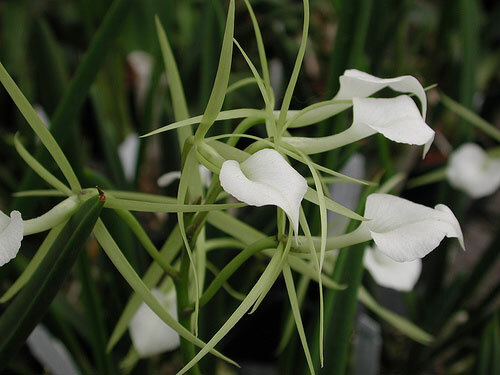 A Brassavola orchid typically has a large pure-white lip, surrounded by narrow sepals and petals. They are fragrant orchids, usually smelling of citrus at night. Care is similar to growing Cattleya orchids, as they are related. The best-known species is Brassavola nodosa, the Lady-of-the-Night Orchid. They like medium to high light. Direct sunlight is usually too much, but 2000-5000 footcandles is reasonable. When they are getting enough light, you'll see red spots appearing on the leaves. Warm to intermediate temperatures are preferred. 70-80°F (21-29C) by day, with a 10-15°F drop at night (6-8C) is ideal. Humidity can be relatively low; 40% is enough, but I'd like to see them grown with 50-70% humidity. They like to dry out between waterings. (The terete, or tubular, leaves are a giveaway: they are an adaptation to relatively dry climates.) Many people grow these mounted on slabs of bark to get more air to the roots, which they seem to appreciate. Growing them mounted means they will dry out more quickly, so be aware that they might want water as often as daily! (It's easiest to dunk them in a bucket. Occasionally you can leave them there for 5-10 minutes to soak up water.) Fertilize regularly while they are growing. These are fairly easy orchids to grow. They are pretty forgiving of neglect, low humidities, and other forms of "abuse". You can also grow impressively large specimens fairly quickly.